Misery is a novel that fits perfectly well with current horror, particularly the works involving torture. Many of the scenes with Annie were not only frightening because of Paul’s physical trauma throughout the novel, but because of Annie’s unstable mentality. These types of characters, both real and fictitious are terrifying as they are the most difficult to judge what their next actions will be. 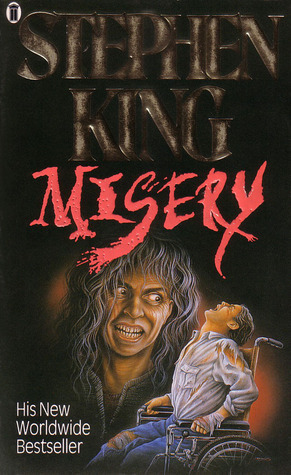 This also makes Misery a fun read for horror fans. There are obvious differences between the novel and film. The novel is more terrifying despite Kathy Bates’s terrific acting, for which she won an Academy Award. One of the reasons being the reader is inside Paul’s head the entire time, which means we are getting the suspense and anticipation of what’s to come in ways film and television are incapable of doing. Furthermore, the violence is more intense in the novel; this is seen when Annie chops off one of Paul’s feet in the novel, whereas Paul’s ankles are broken in the film. One of the most important elements of the novel is the claustrophobia that’s built into the setting. As the narrative progresses, so does the confinement. King does this so well that the reader may not even realize this is happening, which makes it a technique I want to work on in my own writing. While there is still suspense in the opening chapters, the setting, while enclosed, isn’t suffocating. The beginning is more about wonder and curiosity than it is placement. The claustrophobia begins to build when Annie closes the door and Paul hears it lock. From there, it escalates as Paul is drugged and incapable of fully functioning which means this in combination with a body hurt from his initial car crash inhibits his ability to escape before Annie shows just how crazy she is. Paul isn’t only trapped inside the room, he’s trapped within his own body, in a way. Even Misery’s Return, which is colored by Paul’s captivity, increases the claustrophobia. Scratches from Misery’s coffin can be heard, and there may be nothing more terrifying for someone with claustrophobia than being trapped six feet beneath the soil in a small box. King does allow a short reprieve from the room, but only for a short time and the space doesn’t grow all that much. This occurs when Paul leaves his room for the first time; but while the space increases, so too does the fear and suspense. When Paul escapes his room again, this time for a longer period, the reader is once again allowed to relax a bit. Then everything crashes down and it’s revealed that Annie knew all along that Paul had left his room several times. The suspense builds and at the climax, Paul loses a foot and the claustrophobia builds more at this point than it has through any of the preceding scenes. At this point the reader may grow numb to some of the next few points of the novel, which is why King may have underplayed the lobbing off of Paul’s thumb. There is a description of it as well as a sense of pain, but there is so much lead up and the reader is made to know about the thumb so long before it’s described that it’s not a huge, painful shock when the event occurs. This may be to give the reader a sense of numbness along with Paul who experienced it. This, I felt, was an interesting technique and one to study. In the end, without the claustrophobic aspects of Misery, the storyline may have hobbled along; but through the increasing sense of claustrophobia, the misery of the situation is amped up all the way through to the end. I love the confinement and claustrophobia techniques, too. I also noted the buried alive story in Misery’s Return as representing Paul’s situation. Something I just thought about in relation is the numbness that creeps over a person when in a prolonged state of helpless victimization. It can feel quite zombie like. Maybe that was represented there as well. I didn’t really pick up on the claustrophobia aspect in figurative terms. I was more focused on the slow, deliberate journey King takes us through where the entirety of the novel is present in pretty much one room. Now THAT is something I’d like to do. The claustrophobia really just enhanced the tension and the caged feeling surrounding Paul. The parallel with Misery’s Return, and how Paul’s experiences colored the novel was a good overlap. The tension never lets up.